The College has screened 470 athletes this year for heart risk thanks to two electrocardiogram (ECG) machines donated to LC by the Cardiovascular Group of the CENTRA Stroobants Heart Center. 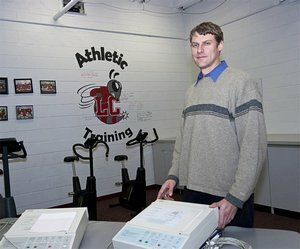 The machines were donated in memory of LC freshman Adam Seymour, whose heart failed less than an hour into the first men’s soccer practice of the 2010-11 season. Adam collapsed during a 1.5-mile run, was given CPR, and was rushed to the hospital in an ambulance. He was pronounced dead three days later. An ECG is a medical test that detects cardiac abnormalities by measuring the electrical activity generated by the heart as it contracts. Pictured at left, Dr. Mark Townsend, a specialist in Pediatric and Adult Congenital Cardiology for the Cardiovascular Group, was a driving force behind the donation and reviews all the ECG tests. The machines are housed in the Walker Human Performance laboratory in Turner Gymnasium. Article by University of Lynchburg / News / athletic training, school of health sciences and human performance.